A while ago I had a pretty bad case of the breakouts. I never had acne in high school, but once I started college - let's just say it was another story! So I went through a million different remedies as I'm sure we all do, and I even have a YT video on some things that have really worked for me. However, there was one secret weapon I forgot about... and that is my exfoliating gloves!! I got introduced to these from a few girlfriends in college, and they are fairly inexpensive. I bought two pairs, one for the shower, and another pair strictly for my face! And let me tell you, these things are amazing!! I've used them for a few years now. I throw them out every 3 months or so .. They are amazing for the skin, they exfoliate so well, unlike any other product that I have used. But they are even more amazing for my face, they exfoliate so well, and I always seem to reduce the breakout problemo everytime I use these =). 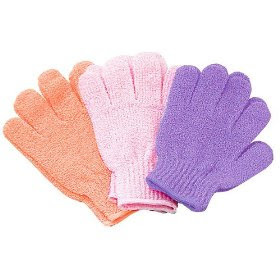 WORD OF CAUTION: These gloves are pretty coarse, so if you have sensitive skin, I would use with caution. You may use them every other day, or use very light motions. Also, if you have deep pore acne, I would not use these as you will only be irritating your skin further. Whichever route you choose, please don't scrub with all your might, as you will irritate your skin. Personally, they worked best for me once the acne had subsided, and I just had to deal with day to day maintenence and prevention. =) (also they work great to help reduce acne scarring, skin will turn over faster).